The following artical appeared in the "teletopics" section of the November 1983 issue of Television magazine. 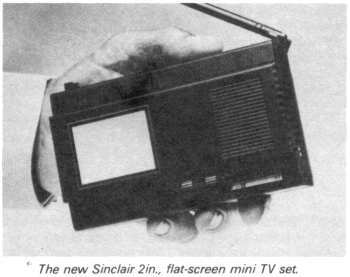 The long-awaited flat-screen Sinclair pocket TV set was officially launched on September 16th, though you can't for the present go out and buy one. To start with the set will be available by mail order only — and you can't send in your money for that either. You send in an order, on a special application form which will be dealt with in order of receipt. The reason given for this rather unusual arrangement is that production is at present limited — the aim is to increase this to 10,000 a month by the end of the year. There's been some criticism of these arrangements, especially from the trade, but it's obviously difficult to get new technology to the mass production stage and it's as well that this much talked about product should be brought out into the open. Application forms are available from Sinclair Research Ltd., Stanhope Road, Camberley, Surrey GU15 3PS. The set has a 2in. screen, measures 5½ x 3½ x 1¼ in. and weighs 9½oz. A special Polaroid flat battery that provides 15 hours' operation has been produced to power it — there's also a mains adaptor. The set itself goes on sale at £79.95, with the 6V Polaroid lithium batteries in packs of three at £9.95 per pack and the adaptor at £7.95, all prices inclusive of VAT, postage and packing. Normal retail and export sales are expected to start during the first half of 1984. Sir Clive Sinclair predicts sales rising to a million or more a year worldwide, and speaks of the set "achieving for television what the transistor radio did for wireless, creating a new one-per-person product". The set has some interesting technical features. It is for example a multi-standard receiver with automatic switching between most u.h.f. standards worldwide except for France. Most of the circuitry is contained within a single i.c. that uses innovative digital techniques to monitor the vision and sound signals and adjust the circuitry automatically to suit the transmission standard. The i.c. was jointly developed by Ferranti and Sinclair Research and is being produced by Ferranti. Manufacture of the flat-screen tube (the gun is mounted to one side and the phosphor is deposited on the rear section of the viewing part) has been subcontracted to Timex in Dundee, using Sinclair designed and owned automatic plant. Assembly of the sets has been subcontracted to Thorn. Apart from the tube and the i.c., the main electronic items consist of the video output transistor, line and field output stages, the tube power supply generator and the tuner. The latter measures just 31 x 23 x 11mm and uses hybrid microminiature components with advanced surface mounting. It's output is at 230MHz, which has been chosen to avoid image frequency problems in the u.h.f. band. The special i.c. uses a combination of linear and digital techniques. The majority of the logic in the i.c. is used to synthesize the field and line scan waveforms digitally, an arrangmenet that allows for multi-standard operation. Fig. 1 shows a block diagram of the chip. A digital countdown circuit is used, with a high-frequency voltage-controlled oscillator that's locked to a multiple of the received line sync pulses. In addition to driving the line logic, the voltage-controlled line oscillator synchronises an identical oscillator in the sound detector circuit. There's also count down from line to field rate, with on-chip logic giving a 525 or 625 line display by adjusting the count and VCO centre frequency. Additional logic improves the line and field lock noise immunity. For correct display on the flat screen the field scan waveform must be modulated by a line frequency correc- tion waveform. The field sweep and correction waveform are both generated digitally, followed by digital-to-analogue conversion. No set-up components or adjustments are required. A further DAC working at line rate produces the signal to drive the line output stage. After amplification the vision signal is applied to a novel low-level envelope detector and then d.c. restored. The intercarrier sound signal is converted to a 250kHz second i.f. The sound channel local oscillator operates at 5.75MHz on 625 lines and 4.75MHz on 525 lines, enabling 4.5 MHz, 5.5 MHz and 6MHz intercarrier sound signals to be demodulated without external switching. The tube's folded electron optics would produce a raster with curved vertical edges and horizontal edges in the form of the sides of a trapezium without correction. The previously mentioned field correction waveform eliminates the trapezium distortion. Optical techniques are used to overcome the other distortion. First, the height is reduced by two thirds with the width held constant. This narrows the angle at which the beam strikes the screen, reducing both the distortion and the deflection power required. A Fresnel lens which is part of the faceplate restores the height optically. The connections to the electron gun and the electrostatic deflection assembly are screen printed on to the baseplate. There are three sets of deflection plates — for line and field deflection and to bend the electron beam so that it strikes the rear phosphor screen. The focusing electrode consists of a transparent tin oxide coating on the tube's front face. Sinclair say that the brightness is up to three times that achieved with a conventional c.r.t. using the same beam energy. A major technical breakthrough is claimed for the perfection of a new method of vacuum forming the glassware. The main competition is Sony's Watchman, which is at present being produced at a rate of 200,000 a year. It sells in the UK at £249. A mark II version is at present being developed and is expected to sell at around £135. It will be smaller and lighter than the present version and will incorporate a redesigned tube.